Istueta Roofing is happy to visit your home or business to conduct a PROFESSIONAL roof inspection and assessment to determine whether we can repair your Miami roof and if a roof replacement is required. We will provide a complete consultation for any work we believe is required. 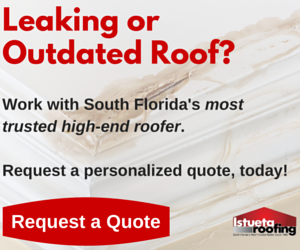 To contact us, please complete the form below so that we can schedule your complimentary roof inspection soon.